Moncel, Count Du. The Telephone, the Microphone and the Phonograph. New York: Harper & Brothers, 1879. 45. See https://archive.org/details/telephonemicrop00moncgoog. In teaching the deaf to speak English, oralists sought a way to “soften” the “distasteful, loud, or harsh voices of deaf speakers” (Esmail 174). Bell’s father, Melville Bell, attempted to do so in the 1860s by developing a phonetic system of writing termed “Visible Speech.” Such a “universal alphabetics,” as he called it, was supposed to teach those with pre-lingual deafness how to properly enunciate English words by visually representing the shapes of sounds. Unfortunately for Bell, the system proved largely unsuccessful because deaf students could not hear themselves speak and therefore could not accurately reproduce sounds (Esmail 184). As a consequence of the inability of Visible Speech to narrow the divide between spoken language and its graphic representation, Alexander Graham Bell, a teacher of deaf children and an ardent oralist who fought for the eradication of sign language, determined to create a device that would serve as a feedback mechanism by visually representing the sounds that his deaf students were making, thus enabling them to check themselves against the tracings of “correct” speech sounds. With the assistance of Clarence J. Blake, an American ear specialist, Bell attempted to modify and repurpose Leon Scott’s 1857 invention, the phonautograph, a mechanism that used the principles of resonance to transcribe speech sounds (Sterne 31–36). 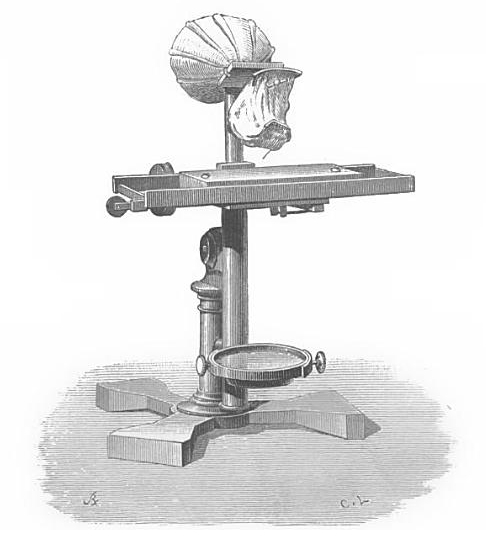 Whereas Scott’s tool featured a membrane-like “diaphragm,” Bell and Blake’s 1874 “ear phonautograph” employed an actual human ear taken from a corpse to transduce sound waves into writing (Sterne 35, 31; Esmail 185). The deaf students’ vocal emissions, funneled through a metal mouthpiece, would vibrate the dead man’s ear, which would, in turn, activate a stylus to make tracings of the voice’s “shapes” onto smoked glass (Sterne 31). With the ear phonautograph, sound is thus experienced as disembodied—as alien to the speaker—and “heard” through the amputated organ of the corpse. As Esmail notes, “[T]he sound that is the source of these visual traces is wholly absent from both their ‘speaking’ and their visual ‘listening’” (Esmail 186). This prosthetic hearing device cleared the way for the invention of other sound technologies that treat sound as dislocated from the body in order to mechanically reproduce it. In fact, as Bell indicates in the lecture excerpted below, the telephone owes its realization to the ear phonautograph. See Douglas Baynton, “‘A Silent Exile on This Earth’: The Metaphorical Construction of Deafness in the Nineteenth Century,” The Disability Studies Reader, 3rd ed. (New York: Routledge, 2010); Jonathan Rée, I See a Voice: Deafness, Language and the Senses—A Philosophical History (New York: Metropolitan Books, 1999); Lennard J. Davis, Enforcing Normalcy: Disability, Deafness, and the Body (London: Verso, 1995); Jennifer Esmail, Reading Victorian Deafness: Signs and Sounds in Victorian Literature and Culture (Athens, OH: Ohio UP, 2013); and Jan Branson and Don Miller, Damned for Their Difference: The Cultural Construction of Deaf People as Disabled, A Sociological History (Washington, D.C.: Gallaudet UP, 2002). I attempted to construct one modelled as nearly as possible on the mechanism of the human ear, but upon going to a friend in Boston, Dr. Clarence J. Blake, an aurist, he suggested the novel idea of using the human ear itself as a phonautograph, and this apparatus we constructed together. It is a human ear. The interior mechanism is exposed, and to a part of it is attached a long style of hay. Upon moistening the membrane and the little bones with a mixture of glycerine and water, the mobility of the parts was restored, and on speaking into the external artificial ear, a vibration was observed, and after many experiments we were able to obtain tracings of the vibration on a sheet of smoked glass drawn rapidly along. Many of those were very beautiful, and I am sorry I have not any of them here to-night to show you, but as it is foreign to our subject, it is perhaps as well. I would merely direct your attention to the apparatus itself, as it gave me the clue to the present form of the telephone. Bell is referencing Leon Scott’s 1857 invention, the phonautograph. This is an account of Bell’s 1877 Salem lectures, which explains his frequent references to visuals for the audience. The first account of these lectures appeared in the 31 March 1877 issue of Scientific American and was accompanied by pictorial illustrations. According to the Shorter Oxford English Dictionary, a style is “[a] sharp instrument or point for engraving, tracing, etc.” (3076). See “Style.” Shorter Oxford English Dictionary. 6th ed. Vol. 2. Oxford: Oxford UP, 2007. Bell, Alexander Graham. “The Telephone.” The Musical Standard 13.698 (15 December 1877): 375–76. Esmail, Jennifer. Reading Victorian Deafness: Signs and Sounds in Victorian Literature and Culture. Athens, OH: Ohio UP, 2013. Sterne, Jonathan. The Audible Past: Cultural Origins of Sound Reproduction. Durham, NC: Duke UP, 2003. “The Ear Phonautograph,” Nineteenth-Century Disability: Cultures & Contexts, accessed April 23, 2019, http://nineteenthcenturydisability.org/items/show/42.